A New Map of the State of Wisconsin. 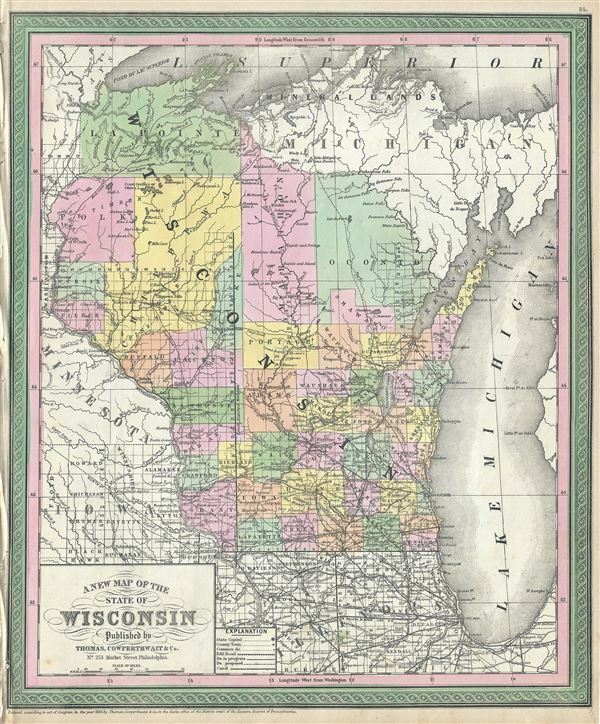 This is a fine example of Thomas Cowperthwait and S. A. Mitchell's 1854 map of Wisconsin. The whole is engraved and colored in Mitchell's distinctive style with green border work and vivid pastels. Political and topographical features are noted and color coded with elevation rendered by hachure. The map outlines with vivid detail counties, towns and topography. Survey grids, referencing the work of the U.S. Land Survey, define the southern half of the state. It includes most of Lake Michigan and the adjacent Chicago metropolitan area. Identifies various canals and railroads throughout the state. Rumsey 3803.038 (1853 edition). Phillips (Atlases) 809.